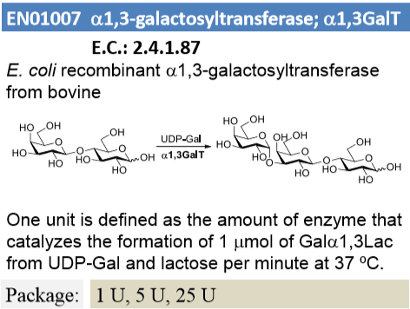 One unit is defined as the amount of enzyme that catalyzes the formation of 1 μmol of Galα1,3Lac from UDP-Gal and Lactose per minute at 37 °C. Basu M, Basu S.Enzymatic synthesis of a blood group B-related pentaglycosylceramide by an alpha-galactosyltransferase from rabbit bone marrow.J. Biol. Chem. 248 (1973) 1700-6. 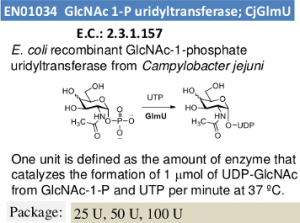 Blanken WM, Van den Eijnden DH.Biosynthesis of terminal Gal alpha 1—-3Gal beta 1—-4GlcNAc-R oligosaccharide sequences on glycoconjugates. 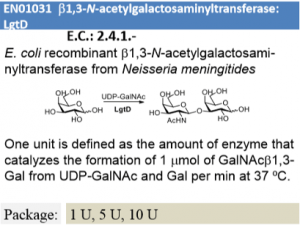 Purification and acceptor specificity of a UDP-Gal:N-acetyllactosaminide alpha 1—-3-galactosyltransferase from calf thymus. J. Biol. Chem. 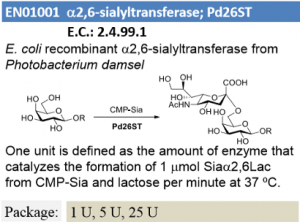 260 (1985) 12927-34.Blake DA, Goldstein IJ.An alpha-D-galactosyltransferase activity in Ehrlich ascites tumor cells. 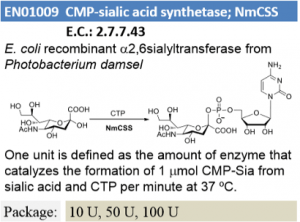 Biosynthesis and characterization of a trisaccharide (alpha-D-galactose-(1 goes to 3)-N-acetyllactosamine). J. Biol. Chem. 256 (1981) 5387-93.